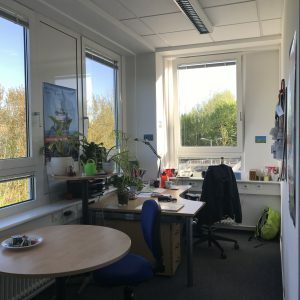 “How can giveaways be designed in such a way that they serve a scicomm purpose?” — that’s April’s #scicommchall. And as I have never been shy to admit, I set #scicommchalls such that they motivate me to do something I’ve been wanting to do anyway but needed a little extra nudge to get around to actually doing it, like developing elevator pitches or doing kids scicomm books. I’ve been thinking for quite some time now about a giveaway for my ocean science communications consultancy, fascinocean. Let’s go through goal – audience – message and see what we can come up with. Ultimately, I want my giveaways to remind happy customers about how awesome I am, and bring in new customers for the kind of services I offer with fascinocean: developing and conducting science communication strategies and products on ocean and climate topics as well as training ocean and climate scientists in scicomm. 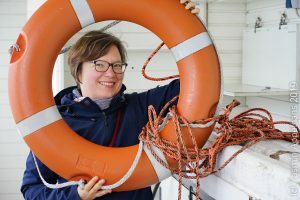 The audience I want to reach are ocean and climate scientists who are interested in scicomm, but either don’t have the time to do it all themselves or want support to do it even better than they already are. I want to ideally reach them directly (so if I meet someone who’s doing interesting research and who I like as a person, I would like to be able to hand them a nice giveaway), almost directly (so for example sending out a small item to people I have worked with that have been supportive or that I would like to initiate collaboration with), and indirectly (like people I work with well want to hand my information on to someone else who they think I would be a good fit with collaboration-wise). But the giveaway is definitely not something that I would want to leave randomly in places where oceanographers and climate scientists gather for them to learn about me to recruit business with total strangers that haven’t come to me either through personal connections or that have found me through previous work I’ve done with others. This is the tricky bit. I’ll come back to this a little later. I have to confess: I went into this whole exercise really fancying the idea of having fascinocean postcards. I have over the last year or so come across two different campaigns that really left a big impression on me. The first one was a campaign on ocean conservation by the German Federal Environmental Agency. They had about five different cards with motives and messages related to protecting the ocean (you can see them here) which I loved so much that I decorated my old office with them, and I recently saw them on the wall in a friend’s office, too, after I had sent them to her. The postcards aren’t actually visible on this picture of my old office, because they weren’t up yet when I took the photo. But they were later added to the cross-piece in the window right in front of my desk, so they were the first things that came into my view when I looked away from my screen to think. 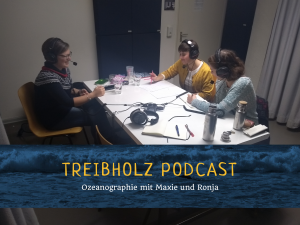 The second postcard I really liked is the one that the german podcast Treibholz with Ronja and Maxie uses to advertise the podcast. (And for those of you who don’t remember that I visited their podcast, you should check out this blogpost). And here is what their postcard looks like (pasted on the cute gift bag they gave me when I was guest on their podcast). 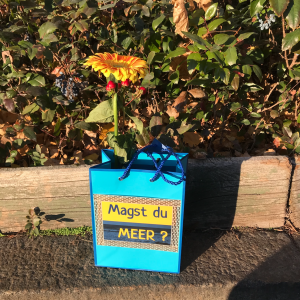 It says “Magst du Meer?” (“Do you like the sea?”) and I think it’s perfect: It’s intriguing and makes you say “yes!” and flip the card over to see what’s it all about, and also the essence of Treibholz is really this huge love for and curiosity about the ocean — those two definitely do like the sea! I love how simple the card is with this very easy beach-ocean theme going on, yet how cheerful and colorful and happy. On the back of the postcard, there is the URL of the podcast as well as a “stamp” with Ronja & Maxie’s picture on it. The postcard takes up design element from the banner they’ve designed for the podcast (see below). When they gave me a bunch of their postcards, I realized I really wanted something like that for fascinocean, too! I’ve actually used the Treibholz postcards a lot to write notes to people, so I know that I actually use this kind of stuff it it’s around and pleasing to look at. So is it postcards or something else? I am not quite sure if I am so set on postcards as my giveaway because of the two examples I mentioned above, or because postcards really suits my purpose well. I think it’s the latter: They are easy to distribute, can carry all the information, give a glimpse at what I can do, and are easily displayed in offices to always remind people of fascinocean. They are essentially the same thing as a postcard, except a lot smaller, right? Their smaller size makes them easier to carry for me, and stow away if recipients are given it at e.g. a presentation and don’t have a bag with them. On the other hand, they also get lost a lot more easily. People are also a lot more used to be given business cards than a postcard, but then I think I’d prefer the element of surprise with the oversized-business-card postcard. I REALLY like the idea of having fascinocean stickers, and I might have to do them just because I want them (is that how universities end up with pool noodle giveaways?). My poster tube is completely covered in stickers of meetings and institutions I have visited with it (come to think of it — I think my poster tube is the most travelled item I own, because everything else, from passports to handbags to phones to jewellery, has been replaced at some point or other. Fascinating. ), and I definitely add any cool new sticker I can get. If stickers are very pretty (like the one the German team used for the International Physics Olympiade used for their 2018 event in Portugal, which I liked so much that it’s still on my bullet journal [it features a lighthouse! Do I need to say more? ]), I also use them in other spots. Like the new EGU journal Geoscience Communication‘s one, or GEO-Tag der Natur’s… So I clearly really like stickers. And maybe it’s possible to produce stickers that are stuck to a postcard, so that there is still space for my contact info etc on the back? On the other hand, that postcard will look really crappy once the first sticker (for some reason I am thinking of having four smaller ones on the postcard) has been removed. And do I really want my giveaway look like that as soon as it’s being used? Maybe the options above aren’t so different (after all they are all flat and printed) and I should think about the message more. Btw, I did follow my own advice and went through some rapid ideation for forms and functions related to fascinocean. Lots of cool stuff there, but most of it will have to wait until I have a larger budget for giveaways, and it also doesn’t match my “must be easy to mail/carry around” criterium. Providing a glimpse into my portfolio — how about motion cards? Motion cards (“Kippkarten” auf Deutsch) are the kind of postcards that show two different motifs if you look at the card from different angles. And something like that could work super well for my purposes: Kinda like a gif that I use to annotate wave pictures, except you can hold it in your hand! This doesn’t show scicomm consulting, but it is a visualization that I use quite often when I am talking about #wavewatching. I try to be supportive and encouraging of my colleagues, and one thing I did when I was still living in Bergen (and I moved away 5.5 years ago) was to put a post-it on the mirror in the lady’s bathroom, saying “Motivation! Take some, it’s amazing” (or something similar) and then at the bottom of the note, had written “motivation!” over and over again and cut in between the individual motivations such that you could pluck one of and take it with you. They were gone within minutes, and I was recently reminded of this when I saw this note stuck to my friend Elin’s old computer that she brought with her on the student cruise. Clearly this was something that worked super well — how could I have a similar impact with a giveaway? Now that I am thinking about it, when my book on wave watching was new, I actually gave a lot of copies to friends and colleagues and that definitely had an impact similarly to what I want to achieve now with this giveaway. Except that continuing to give away those books to everyone I want to remember that I do cool scicomm is just too expensive, so I need something that is cheaper to produce. And if you have read all of this (really? Thank you!) what are your suggestions? I’d be grateful for any input I can get!